This recipe for Thai pan-fried dumplings - also known as pot stickers - is easy to make and certain to please everyone at dinner. A wonderful dim sum treat, the filling for these pot stickers is quickly put together using chicken or shrimp (frozen shrimp works fine). Combined with a few other Thai ingredients, these Chinese-inspired pan-fried dumplings are chewy-good. Serve with a dip of your choice, or follow the suggestions in this recipe. Pan-fried dumplings can be served on their own, or served with cooked egg noodles (the stir-fry type) . If dumpling wraps are frozen, remove from freezer to thaw several hours before you will be wrapping. Place all other ingredients in a food processor. Blitz to create a fragrant and tasty filling. 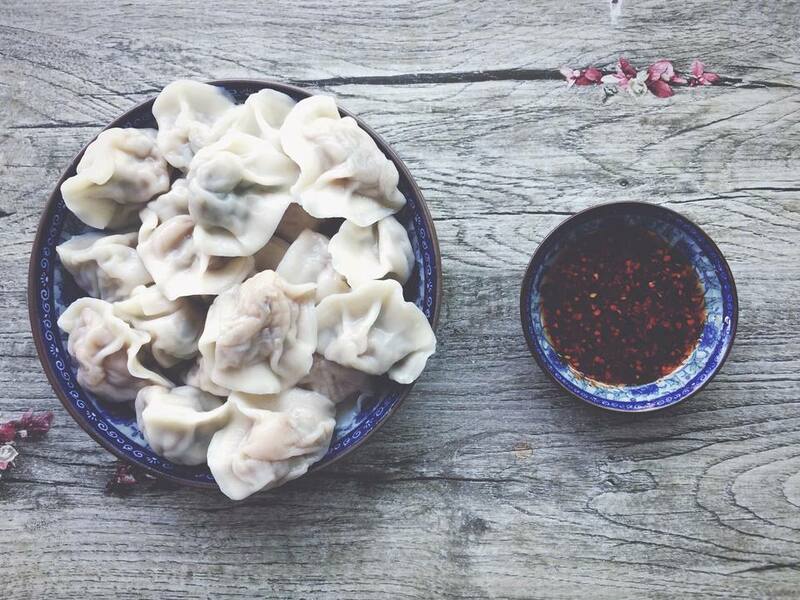 Making 6 to 8 dumplings at a time, lay out 6 to 8 wonton wrappers on a clean working surface. You will also need a small dish of water. Spoon a little of the filling onto the middle of each wrapper (about 1 heaping tsp.). Then dip your fingers in the water (or use a pastry brush) and moisten the outside perimeter of each wrapper. Bring the sides of the wrapper up over the filling and press together to seal. If it doesn't seal, moisten the edges with a little more water. Pinch along the seal to create a decorative edge. Set the finished dumplings on a plate dusted with a little corn starch or flour. Standing back from the stove, gently pour 1/2 cup chicken stock/broth into the frying pan (the pan will sizzle and may spurt a little). Cover and allow dumplings to finish cooking (about 5-7 minutes). When most of the broth is gone, remove pan from heat. Use a spatula to gently lift the pot stickers from the pan and transfer to a serving plate. Tip: they are called pot stickers for a reason! But they will stick less if there is still a little moisture left in the pan - if the pan dries out completely, the dumplings will stick). Serve with a dipping sauce of your choice. Try them with the following mixture of sauces: 2 Tbsp. soy sauce, 2 Tbsp. Thai sweet chili sauce, 1 Tbsp. sesame oil, 1 to 2 tsp. regular Thai chili sauce, plus 1 to 2 Tbsp. fish sauce (add more fish sauce until desired saltiness is reached).